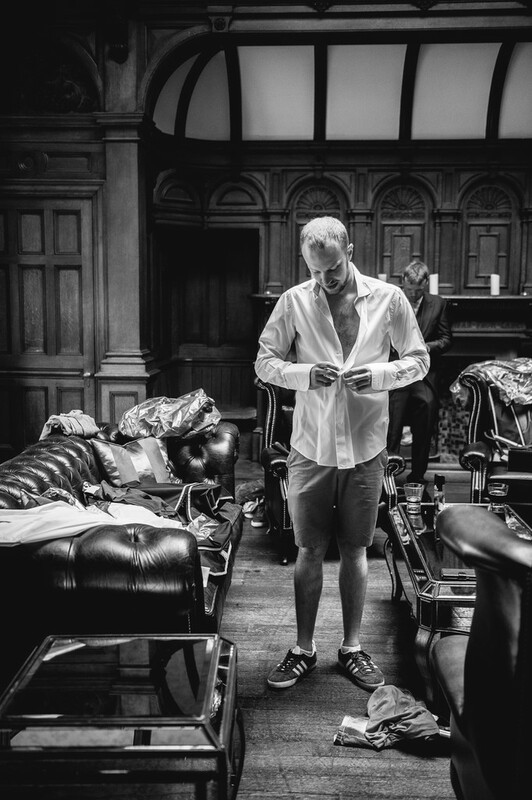 The groom puts his shirt on before his wedding ceremony at Manor by the Lake in Cheltenham. Manor by the Lake has great transport links, being very close to a major road (I know I'm not selling this yet but bear with me.) The venue is also next to a business park, so the drive to the venue is very deceiving. Because the venue is incredible! As soon as you arrive in the car park and walk a few steps into the grounds of the manor grounds, you could be anywhere. There isn't a hint of road noise, and the perfectly kept gardens shield you from anything of the outside world. You would have no idea that you're only 2 minutes from a major road, and the peacefulness of the Manor by the Lake is slightly disorientating because of it. With ample grounds, a landscaped garden and (as the name suggests) a lake, you have all the opportunity you could ever want for amazing wedding pictures. The inside of the Manor by the Lake doesn't disappoint either. There are suites for the bridal party to get ready, and ample rooms to house all of your wedding guests. This picture was taken in the Rock Bar, a little hideaway deep within the venue that a lot of groom's choose to get ready in. Will was one of those grooms, and he spent the morning relaxing in the bar, playing pool with the father of the bride and his other groomsmen. The reason this image works so well is the quality of the light coming in from the left side of the camera frame. With the dark wooden panels that make the background, this photo has a beautiful contrast to it. A simple photo showing nothing than a man putting a shirt on is transformed by a little natural light and the right shooting angle. To view the Manor by the Lake wedding website, please click here. Location: Manor By The Lake, Hatherley Lane, Cheltenham, GL51 6PN.